COCOA, Fla. -- Visiting Florida's Space Coast on Wednesday, Republican presidential hopeful Newt Gingrich unveiled what he called a "bold" and "visionary" plan for space exploration, vowing to construct a permanent moon base by 2020 and catalyze robust commercial activity in near-Earth space. Gingrich did not say how he would pay for the program or how much it would cost, but he suggested setting aside 10 percent of NASA's budget for prize incentives aimed at the commercial space sector. "By the end of my second term, we will have the first permanent base on the moon, and it will be American," Gingrich said in remarks at a rally in Cocoa, Fla. "We will have commercial near-Earth activities that include science, tourism and manufacturing and are designed to create a robust industry precisely on the model of the development of the airlines in the 1930s because it is in our interest to acquire so much experience in space that we clearly have a capacity that the Chinese and Russians will never come anywhere close to matching." Gingrich, the former House speaker, also said there should be a "continuous propulsion system" in space capable of traveling to Mars in a "remarkably short time." "I'm sick of being told we have to be timid, and I'm sick of being to told we have to limited to technologies that are 50 years old," Gingrich said. Space industry leaders met the plan with enthusiasm, but some wondered how such a plan would garner support in Congress amid deadlock and tensions over spending. "We listened to your remarks, and we like what we heard," said Robert Whelen, chairman of the Economic Development Commission of Florida's Space Coast. "The reason you have to have a bold, large vision is you don't arouse the American nation with trivial bureaucratic irrational objectives," Gingrich told Space Coast officials later Wednesday at a roundtable in Cocoa. "It gets to the question, do you want to be part of the generation that goes to the moon and Mars, or do you want to have pork?" "We'll see how it works out if I win, but I suspect having been speaker, I have a reasonable level of understanding of how to move the institutions," Gingrich said. 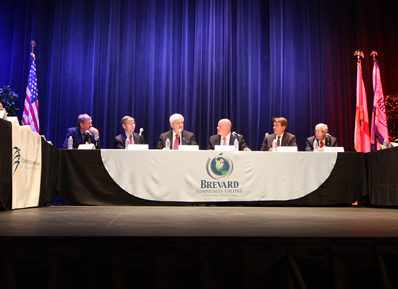 Gingrich was in Brevard County, home of the Kennedy Space Center, for several hours Wednesday evening. The Space Coast is an important region in the Florida Republican presidential primary scheduled for Jan. 31, and thousands of jobs in the Brevard County are tied to the space program. "I think you conveyed a very good long-term vision," said Mark Nappi, head of Florida operations for United Space Alliance, a NASA operations contractor for the space shuttle and the International Space Station. But Nappi told Gingrich another change in direction for NASA could cause more delays. "When we come up with another change in policy, we know that is going to result in another slip," Nappi said. Mark Bitterman, vice president of Washington operations for United Launch Alliance, highlighted policy inconsistencies between presidents and NASA administrators, saying a new U.S. spacecraft would have been flying by the time the space shuttle retired had the government stuck with plans a decade ago. "If we had followed through, if the executive branch had followed through, a decade ago, there's no question that we would be launching [humans] perhaps on Delta 4s and Atlas 5s today. It's political will. We don't have a space policy today with any degree of consitency, nor do we have in the Congress any champions for space," Bitterman said. "What we have is people who protect their centers. I understand why they would do that. But the visionaries? Few and far between." Mitt Romney, who is hovering near Gingrich at the lead in recent Florida primary polls, will appear in Titusville near the Kennedy Space Center on Friday. The unemployment rate in Brevard County was 10.8 percent in December, higher than the national average of 8.5 percent in the same period. The county's economy has been reeling after the 2008 recession and layoffs stemming from the retirement of the space shuttle program. Gingrich described the state of the nation's space program as "tragic" in his remarks, but the former speaker, writing in the Washington Times in February 2010, endorsed President Barack Obama's decision to cancel NASA's Constellation moon program and transition to commercial transportation to low Earth orbit. When asked during a debate Monday night if he supported a more commercial approach for NASA or more funding for the space agency, Gingrich said "the two are not incompatible." "I would like to see vastly more of the money spent encouraging the private sector into very aggressive experimentation, and I would like to see a leaner NASA," Gingrich said Monday. "I don't think building a bigger bureaucracy and having a greater number of people sit in rooms and talk gets you there, but if we had a series of goals that we were prepared to offer prizes for, there's every reason to believe you would have a lot of folks in this country and around the world who would put up an amazing amount of money and would make the space coast literally hum with activity because they would be drawn to achieve these prizes: Going back to the moon permanently, getting to Mars as rapidly as possible, building a series of space stations and developing commercial space." Romney was also asked about his opinions of President Obama's plans for NASA. "His plans for NASA? He has no plans for NASA. The Space Coast is struggling." "So what's the right way forward? I happen to believe our space program is important, not only for science, but also for commercial development and for military development," Romney said. "I believe the right mission for NASA should be determined by a president, together with a collection of people from those different areas, from NASA, from the Air Force space program, from our leading universities and from commercial enterprises. Bring them together, discuss a wide range of options for NASA, and then have NASA not just funded by the federal government, but also by commercial enterprises. Have some of the research done in our universities. Let's have a collaborative effort with business, with government, with the military, as well as with our educational institutions."